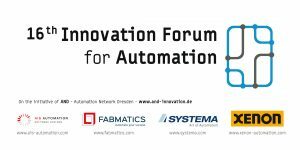 Fabmatics and the entire Automation Network Dresden invite you to the 16th edition of the Innovation Forum for Automation at the DGUV Conference Center in Dresden on January 24/25, 2019. Every year, international industry leaders meet in Dresden to discuss the increasing flexibility in the manufacturing sector and the associated requirements for automation technology and intelligent control of semiconductor factories and other high-tech productions. The two-day, English-language forum is aimed at more than 250 executives, managers, engineers and researchers and offers an excellent platform for presenting and discussing the latest applications and solutions from the field of factory automation. The 16th Innovation Forum for Automation will focus on interesting practical presentations by Magic Leap, Applied Materials, Bosch, Infineon, EOS, Nexperia and Bitnamic, among others. At the dinner party in Lingner Castle on Thursday evening, a company will receive the “Innovation Award” for the implementation of a particularly innovative automation project. The forum is organized by the Automation Network Dresden (AND), consisting of the four automation specialists AIS Automation Dresden, Fabmatics, SYSTEMA and XENON.